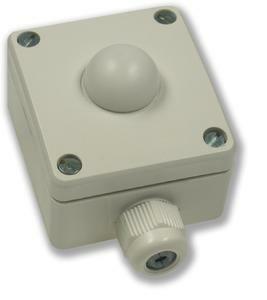 The brightness sensor is a light sensor for building automation. It is protected against over-voltage and voltage fluctuations and suitable for continious operations. For the measurement of intensity of illumination a precise and longterm stable photodiode is used. Advanced sensor technology provides a digitally processed signal transformed into a linear analog output voltage. The module has a high sensitivity over a wide range of different light levels. Thus the brightness sensor can also be used under very bright lighting conditions.